With our human-powered conscious generation today, a new group cycling workout can now make a real difference generating renewable energy. A group spinning class generates about 300 kWh, according to Jay Whelan, founder and president of the Green Revolution, www.egreenrevolution.com. 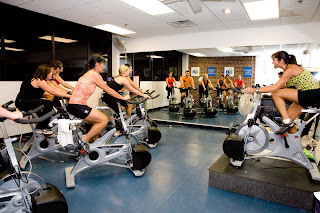 Green Revolution helped set up the new system that captures and stores energy at Ridgefield Fitness Club in Hartford, Connecticut, using Schwinn stationary bikes, which are connected to a cabinet that functions as an inverter connected to the club's grid. On average each class member generates between 50-100 watts when exercising at a moderate pace for about an hour. The entire group cycling studio, comprised of 17 indoor cycles, is connected to the club’s electrical grid through an inverter, so that human electricity can be used to power all aspects of the facility. Any excess electricity generated from the club has the potential to return to the power grid for others in the community to use. A typical group cycling class with about 20 bikes has the potential to produce up to 3.6 Megawatts (3,600,000 Watts) of renewable energy per year. This is equivalent to the amount of power needed to light 72 homes for a month, while also reducing carbon emissions by over 5,000 pounds, according to Whelan. *Note www.KineticCycling.com, a new group cycling center located in Brentwood, CA, has a few Green Revolution’s bikes, and are testing their popularity within the group cycling experience.